Your private Airporttransfer Taxi in one of the world's most glamorous ski resorts - St. Anton am Arlberg Tirol Austria. We will take you comfortably and safely with our cars to your hotel pension or chalet. Our services are available 24 hours a day in the winter season. Professional taxi service with quality and attractive prices. Benefit from our special offers! 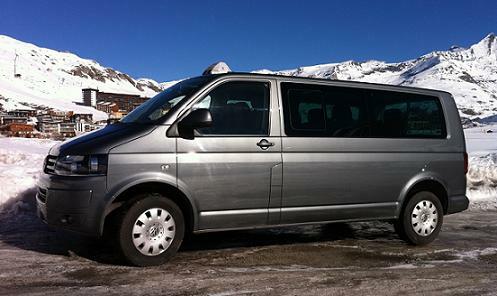 We use spacious 9 seater taxis (1 driver + 8 passengers) Volkswagen Caravelle 4×4 – four wheel drive. All prices are per taxi and for one trip. This is your private taxi transfer and you do not share it with other passengers. You not pay extra for luggage. All pieces of luggage are included. The taxi driver will be waiting for you at the airport terminal, holding a sign with your name. All payments are made in cash, directly to your driver. Zürich - Innsbruck - Friedrichshafen - Memmingen - Munich - Salzburg - Basel - Altenrhein/St.Gallen - Stuttgart - Milano - Bozen - Linz - Wien. Wiht our minivans taxi VW Caravelle we can to transport up to 8 passengers. We will transfer you in the morning to where you want to ski or snowboard in St. Anton, Lech, Oberlech, St Christoph, Zürs, Stuben, Sonnenkopf, Alperauz and take care of the journey back too. In the afternoon we take you to the apres ski party in Mooserwirt, Krazy Kanguruh, Taps, Sennhütte, Griabli, Kaminstube or Heustadl. We offer you local taxirides to: Nasserein, St. Jakob, Gsör, Gand, Untergand, Oberdorf, Stadle, Dengert, Moos and trips to the vicinity villages: St. Christoph, Pettneu, Schnann, Flirsch, Strengen etc. We will take you quickly and safely from collect you from any of the Arlberg surrounding train stations: St. Anton – Langen – Ötztal Imst – Landeck Zams – Innsbruck – München – Salzburg – Zürich etc. All fields marked with ( *** ) are required and must be filled in !!! Please ensure you write the correct airline and flight number. This is vital should your flight be delayed or cancelled. We will not accept responsibility should problems arise from incorrectly entered details !!! Please ensure you enter the full address where you will be taken to and/or picked up. Without street address and number your driver may not find your destination. Or a different driver on return to pick you up, may not find you. Please arrange the date and the time of your return journey directly with the driver !